Note: All 6" diameter stacks narrow to 5" on the end. 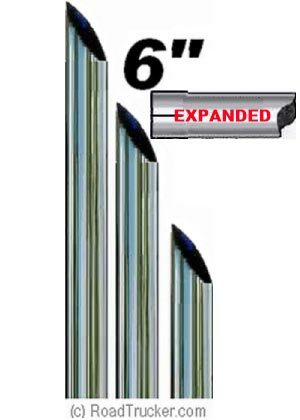 That 5" section is 4" long and comes in both Plain (5"OD) and Expanded (5" ID). SuperPremium Chrome Exhaust Stacks for Truckers with Miter Cut and Expanded end has a 5" Inside Diameter. Length is 36", 48" and 60". Plain = 5" OD; Expanded = 5" ID. 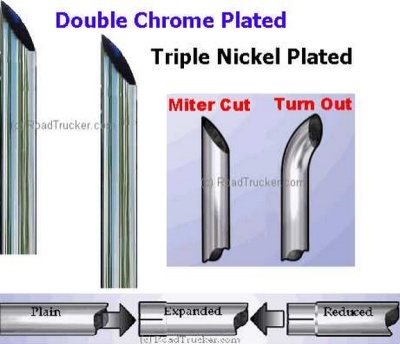 RoadTrucker also carries a line of 5" Miter Chrome Truck Exhaust Stacks. Note: Change the Quantity to 2 to get your 2nd Stack for 1/2 Price. For example, 1 60" Plain Stack is $217.73, the 2nd is 1/2 Price for $108.86 for a Total Price of $326.60 The Cart will change to show 2 Stacks for $163.30 each Total $326.60).